9 common types of clouds in a fun online geography learning game. 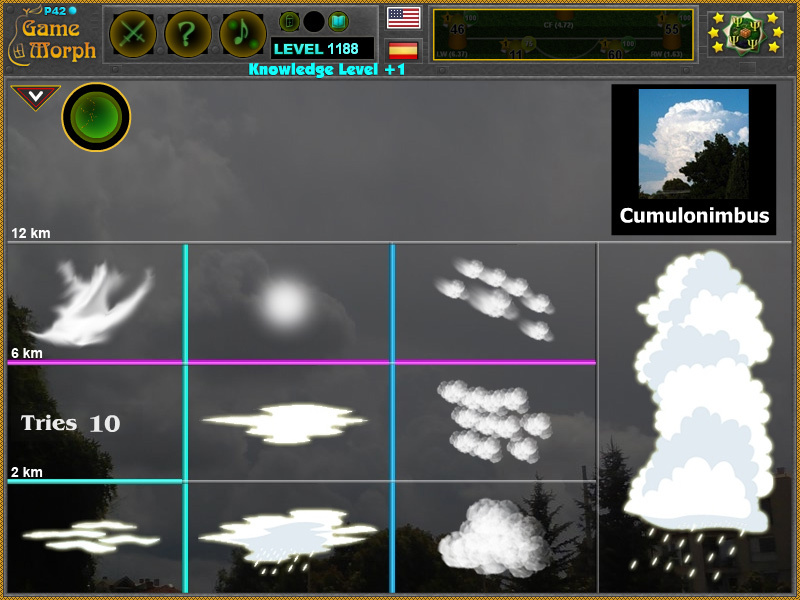 "Cloud Puzzle" is a free online knowledge level game to sort the cloud types by altitude. It include names and pictures of 9 cloud types to play with. Free online game to learn and identify common types of clouds in the troposphere. Geography puzzle game, suitable for online lessons and interactive classes. Minute to win it game. Background picture and game code by Ogo Bob. How to play Cloud Puzzle. There are 9 movable pieces of clouds on the top of the game screen. Drag and drop them in the correct socket on the diagram. Sort all 9 clouds to win the game. Know and memorize the 3 main types of clouds and get +1 Knowledge Level. Few people remember the types of clouds in secondary education, but then we can often hear them in the weather forecasts. The list of cloud types classifies the tropospheric genera as high (cirrus, cirrocumulus, cirrostratus), middle (altocumulus, altostratus), multi-level (nimbostratus, cumulus, cumulonimbus), and low (stratocumulus, stratus) according to the altitude level or levels at which each is normally found. Small cumulus are commonly grouped with the low clouds because they do not show significant vertical extent. Of the multi-level genus-types, those with the greatest convective activity are often grouped separately as towering vertical. The genus types all have Latin names. What kinds of clouds are there? How high are clouds formed? Which are the 3 main types of clouds?